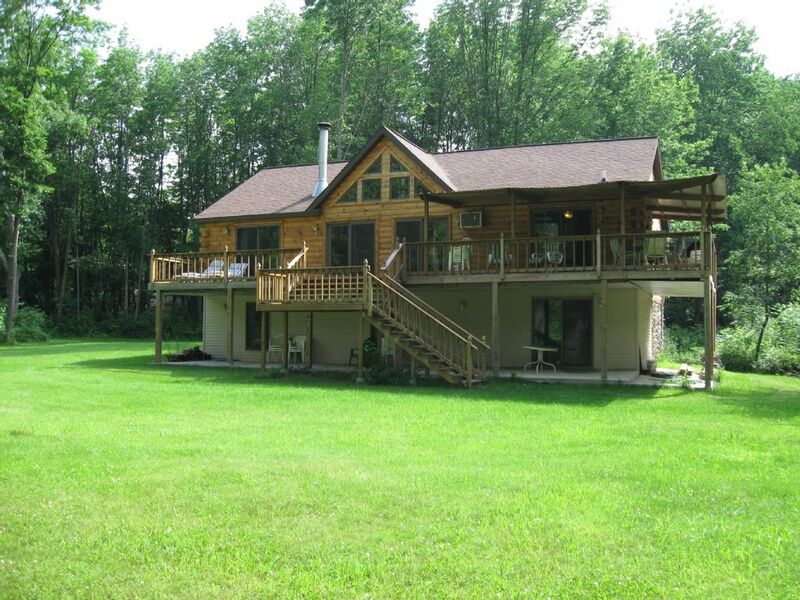 Beautiful waterfront home on 4 acres with breathtaking views of the Esopus Creek, Broad Hollow Stream, and Mountains. Guests have always been in awe of the beauty of the setting. Only 1 mile from Phoenicia border-3 miles from Village. Secluded to be a great party house or romantic couples retreat, but not isolated as it is conveniently located on a private road off of Rt 28. All the comforts of home with a fully equipped kitchen, and cozy fireplace in the living room. Amenities also include cable tv, hi-speed wireless internet, and a washer/dryer. Each room has TV & DVD, or maybe you'll prefer listening to the rushing Esopus which can be heard from virtually every room in the house. The lawn is great for sports, running around, or having a campfire. The magnificent 60 foot deck was built for a party and has a section that is covered so that you can stay dry and take a nap outside listening to the rain gently dance on the tin roof. We have lowered our fall rates by 20 percent as reflected in the online price. We rented the Mike’s house with another family for the ski season. The house is large enough for two families and about a 15 minute drive to Belleayre Mountain and a 40 minute drive to Plattekill Mountain. Loved our stay, nice place to explore the Catskills from here. Great stay for a few days with our children and grandson. We didn’t have great weather but did manage a day at Bellayre beach and an evening campfire. Woodstock and Kingston were easy to get to for rainy day activities along with plenty of nearby dining choices. The creek is a huge draw for this house. The kitchen is well equipped. We had a great time! We needed more towels, however! One of the four bedrooms is windowless, and the basement futons were not appealing for adults. But the upstairs is nice. We stayed at the Getaway for the week of July 4th. The weather was very hot but the AC upstairs in the house kept us cool and comfortable. Mike was great to work with as a host. His housekeeper did a super job getting the place ready and showing us around when we got there. Esopus Creek was beautiful and a nice refreshing place to visit given the hot weather. The porch was a great place to hang out. The yard is huge, plenty of room for all sorts of outdoor games. We did not use the fire pit, it was that hot! All in all, a wonderful week in Allaben. Shandaken is located in the center of the beautiful Catskill Mountain Forests Preserve and 3 miles from the quaint town of Phoenicia which offers unique shopping, delicious food, and tubing down the Esopus Creek. Minutes away are fantastic hiking trails for all desired difficulty levels ranging from Giant Ledge to Mount Tremper Fire Tower. Only 12 miles from Woodstock which offers a wide variety of shops, restaurants , music and cultural events. The drive there offers beautiful country roads and views. The Catskills offers natures best for all seasons whether it's Trout fishing in Spring, tubing down the pristine Esopus in Summer, enjoying fantastic fall foliage in Autumn, or skiing at one of the three major mountain areas nearby (Belleayre 8 miles, Hunter 17 miles, Windham 25 miles away). America’s original wilderness is a region vivid with natural beauty, enticing to the senses, and filled with fun. There are significant discounts available for two week day rentals. $500 Security Deposit is Required. It is fully refundable and returned within 5 business days as long as no damage is done to the house.